If your homeowner client is feeling underwhelmed by their bathroom, giving it a makeover can completely change the essence of the room. The bathroom is also one of the most used rooms in the house, so your client can have some fun in customizing it to their everyday lifestyles. At ProSource® of Springfield, our large selection of bathroom products can transform your client’s bathroom dreams into reality. A bathroom sink is much more than just a sink — it’s a home fashion statement. 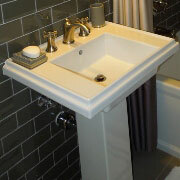 Long gone are the days where having a standard, two-handle, ceramic sink is cool. 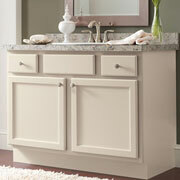 These days, homeowners can get as personal as they want with their sink style, color, size or shape. Our sinks at ProSource aren’t just stylish — they’re also extremely functional. Your client’s bathroom sink faucet could be an easy detail to overlook, but it’s not one that should fall by the wayside. Faucets serve a strict purpose of flowing water through them, but these days, there are so many different handles and finishes; faucets can also be acknowledged as a design statement. The shower is a main focal point of a bathroom, whether it’s a walk-in, shower stall, or tub-shower hybrid. Upgrading your client’s shower with tiny, intricate details can turn your client’s bathroom into one of the most luxurious in their home. 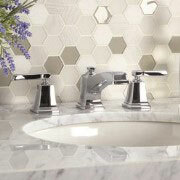 At ProSource, we offer shower products such as shower heads, handles and faucets. Our collection of vanities aren’t only stylish with flashing lights and mirrors, but they can offer storage and counter space as well. 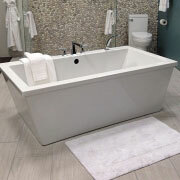 At ProSource, our tubs can fit your client’s home design, whether that’s contemporary, modern, minimalist or traditional. Our tubs range in materials from marble to fiberglass, and we offer a variety of colors that can please any of your clients. 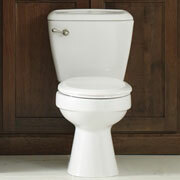 The toilet is an item in the bathroom your client will use daily. At ProSource, our toilet selection boasts different designs and colors — including some toilets with specialized and unique functions. Find your client a throne that makes them feel like royalty.